US EPA and the Army Corps of Engineers have proposed adding an applicability date to the much-debated 2015 Waters of the United States (WOTUS) Final Rule. The Final Rule, still stayed nationwide by court order and now under consideration by the Supreme Court, expanded the scope of the Clean Water Act to address discharges to bodies of water not previously covered. Lion Technology this week launched a new HAZWOPER Awareness level training for employees at facilities who may discover or witness a hazardous substance emergency release. If environmental groups and concerned citizens find they cannot achieve their aims by bringing EPA to court, they may double their efforts to sue individual facilities for perceived violations of environmental law and regulations. 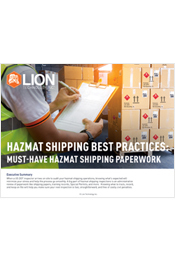 In December, Lion crosses the finish line of our 40th year of collaborative, engaging workshops for dangerous goods, environmental, and safety professionals nationwide. Since 1977, one thing has remained the same year in and year out—there’s always something new to learn. US EPA will host two public meetings, on December 6 and 11, to update interested parties about the Agency’s progress toward implementing changes to the Toxic Substances Control Act (TSCA) made in 2016. In today’s Federal Register, US EPA posted additional information regarding its efforts to repeal or delay three recently finalized Clean Air Act requirements. As we reported in August, EPA faces pushback from environmental groups and State Attorneys General who want the latest Clean Air Act protections to remain in place. In a settlement reached with the US EPA, the US Department of Justice, and the Louisiana Department of Environmental Quality (LDEQ), a major oil and gas company has agreed to install and operate air pollution control and monitoring technology at five of its petrochemical and plastics facilities in Texas and Louisiana. Looking for new ways to earn CEUs, maintain your professional license or certification, or learn more about how EPA regulations impact your business? Look no further! On November 6—7, Lion Technology will present the Complete Environmental Regulations Workshop in North Jersey. US EPA last week proposed a reporting requirement for persons who manufacture or import mercury and mercury-added products. The information EPA collects will help the Agency make recommendations to further reduce mercury use in the US. As required under Title IV of the Clean Air Act, every year, US EPA adjusts the penalty for excess emissions of sulfur dioxide and nitrogen oxides—the primary sources of acid rain.